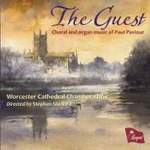 The guest : choral and organ music of Paul Paviour / Worcester Cathedral Chamber Choir, directed by Stephen Shellard. Recorded/performed at: Worcester Cathedral, England Paul Paviour Christopher Allsop 3 mins, 55 sec. Recorded/performed at: Worcester Cathedral, England Paul Paviour Worcester Cathedral Chamber Choir, Christopher Allsop, Eileen Roberts, Stephen Shellard 7 mins, 49 sec. Recorded/performed at: Worcester Cathedral, England Paul Paviour Christopher Allsop 6 mins, 4 sec. Recorded/performed at: Worcester Cathedral, England Paul Paviour Worcester Cathedral Chamber Choir, Christopher Allsop, Stephen Shellard 6 mins, 6 sec. Recorded/performed at: Worcester Cathedral, England Paul Paviour Worcester Cathedral Chamber Choir, Christopher Allsop, Stephen Shellard 7 mins, 54 sec. Recorded/performed at: Worcester Cathedral, England Paul Paviour Worcester Cathedral Chamber Choir, Stephen Shellard 2 mins, 4 sec. Recorded/performed at: Worcester Cathedral, England Paul Paviour Worcester Cathedral Chamber Choir, Stephen Shellard 3 mins, 4 sec. Recorded/performed at: Worcester Cathedral, England Paul Paviour Worcester Cathedral Chamber Choir, Christopher Allsop, Stephen Shellard 4 mins, 37 sec. Recorded/performed at: Worcester Cathedral, England Paul Paviour Worcester Cathedral Chamber Choir, Christopher Allsop, Stephen Shellard 8 mins, 52 sec. Recorded/performed at: Worcester Cathedral, England Geoffrey Ainger and Paul Paviour Worcester Cathedral Chamber Choir, Stephen Shellard 2 mins, 15 sec. Recorded/performed at: Worcester Cathedral, England Paul Paviour Worcester Cathedral Chamber Choir, Stephen Shellard 5 mins, 4 sec. Recorded/performed at: Worcester Cathedral, England Paul Paviour Christopher Allsop 4 mins, 46 sec. Recorded/performed at: Worcester Cathedral, England Paul Paviour Worcester Cathedral Chamber Choir, Stephen Shellard 2 mins, 28 sec. Recorded/performed at: Worcester Cathedral, England Paul Paviour Worcester Cathedral Chamber Choir, Stephen Shellard 1 mins, 24 sec. Paul Paviour is one of Australia's best-known composers. His output is both substantial and varied. This is the first disc entirely devoted to Paul Paviour's compositions, and most of the works are receiving their first recording. Recorded in Worcester Cathedral, this collection presents a broad overview of his work for smaller choral forces, including works written for a royal visit, the dedication of a new organ, carols for Christmas and Easter, and an organ piece based on Edward Elgar's only psalm chant. Also included is Paviour's newest composition, The Morning Watch, especially written for Stephen Shellard and the Worcester Cathedral Chamber Choir in 2012. Liner notes include program notes and lyrics. Score: The guest : for chorus (SATB), strings, harp (or piano), percussion and organ / music: Paul Paviour. Score: Love of the Father : anthem for S.A.T.B. and organ / by Paul Paviour. Score: That blessed place : carol (S.A.T.B. unaccompanied) / words: 15th century ; music: Paul Paviour. Score: Dithyramb : for organ / by Paul Paviour. Score: The glories of this noble sound : anthem for organ and SATB / Paul Paviour.